Guidestone Colorado - We Grow Farmers! - What is a "VISTA"? Let me explain! What is a “VISTA”? Let me explain! Poverty. That’s what I’m here to address. Ridiculous, right? My name is Gunnar Paulsen and I am Guidestone’s AmeriCorps OSM/VISTA member from July ’13 to ’14. AmeriCorps VISTA. What is a “VISTA” you ask? Well, it stands for Volunteers in Service to America and is a national program that places individuals in year-long, full-time volunteer positions with non-profits and government organizations across the country. The mission of a VISTA member is to build the capacity of his or her host site – to increase what that particular organization can do, whether it is through community outreach and volunteer coordination, fundraising, or improving organizational operations. To be awarded a VISTA from the National Corporation for Community Service, which lasts for three years, a host site must address some aspect of poverty in its mission. Poverty is obviously a large and daunting problem, and rather than existing as a single “problem,” it might more accurately be described as a complicated matrix of social, economic, racial and geographic factors. See, even defining it is hard. To learn about its multifaceted causes and cycles, VISTA sends each incoming member to a Pre-Service Orientation. Last month I attended mine. It was held at a hotel on the outskirts of Denver, and was comprised of over 200 other new VISTAs who were also starting service terms all across the country. I met folks who would be serving in Washington D.C.; Austin, TX; New Orleans; the Navajo Nation; Baltimore, MD; and even a few others serving in rural Colorado. When I first heard what many of these folks would be doing with their service term – working with organizations that mentor the children of incarcerated parents, teaching financial literacy to new immigrants, and providing free legal advice to disadvantaged persons, and all mostly in urban centers – I was intimidated and felt pretty out of place. It seemed like they would be combating poverty in a very direct way, and it was hard to see how Guidestone fit into the particular VISTA paradigm. Then I got to thinking. Guidestone’s mission is “dedicated to strengthening the local food economy through preserving agricultural resources and educating for ecological literacy,” and while at first glance that doesn’t seem to directly address poverty – the connections certainly aren’t as apparent as my fellow VISTAs’ missions, right? – Guidestone’s mission does address poverty at a root level. Guidestone works towards its mission through three main programs. Through the Garden to Cafeteria program – which delivers fresh produce from the Salida School Gardens on Holman Ave. to all three Salida School District cafeterias for incorporation into meals – we vigorously combating Chaffee County’s above average obesity rates (26% of residents are obese, thats 6% above state average) by working with the most vulnerable among us, children. A result of food insecurity and lack of proper nutrition, obesity has been declared a national epidemic by health-care professionals nationwide, and childhood obesity – which has increased three-fold in the last three decades – is even more damaging because it is often a lifelong sentence to ill health and socioeconomic disadvantage. Directly, produce from the garden reaches 1,085 students, 180 staff, and hundreds of families. As the garden expands to reach its 4 acre capacity, it will supply 99.9% of the School District’s vegetables and 10% of its fruit, totaling 5,190lbs. By working with key community partners to incorporate the garden and nutritional education into school curriculum we believe that we can have a strong impact on obesity rates long term in Salida. The next facet of Guidestone, our Farmhands Youth Education Program, while it doesn’t explicitly frame its mission as such, also takes a long view towards combating poverty. 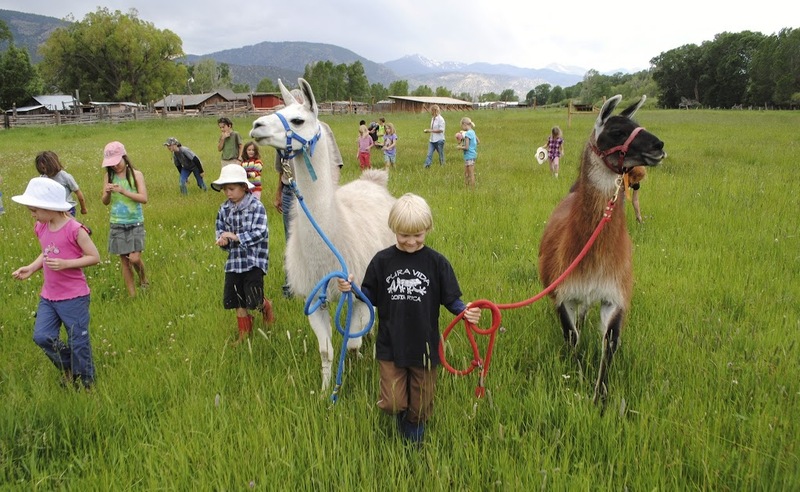 Farmhands seek to re-connect children with their natural environment, to show them where healthy food comes from and how it is grown or raised. In addition to combating the spiritual poverty that is rife within contemporary mainstream culture – which has little to no value for nature, reflection, history, or community – these programs increase regional access to quality educational programming. We hope these programs foster a lifelong curiosity and facilitate positive connections to the natural world for each child that experiences them. Such a goal is hard to measure quantitatively, but after spending a summer co-teaching the kids at Guidestone’s immersive 4-day camps I truly believe that they will hold onto the creativity and wonder of childhood throughout their lives, and that that positive energy will guide them through meaningful, successful lives. Lastly, Guidestone’s Colorado Land Link program, which is designed to make connections between retiring farmers, ranchers, and landowners and connect them with aspiring agricultural producers, guiding both parties through this delicate process. This service is greatly needed in a time when the financial viability of ranching and farming is diminishing, rendering offers of cash buyouts from developers seeking land and water all too tempting. By having strong agricultural producers in the region, the local economy is strengthened, community access to high-quality foods increases, alternative and entrepreneurial business models thrive, and the unique character and history of the state and region are preserved. If we fail to preserve our agricultural lands for agricultural purposes, we will continue to depend on a fossil fuel based food economy, which is unhealthy for our planet and our bodies. And that is how I’ve come to see Guidestone’s mission and how it relates to VISTA’s. During my time here, I’ll work for Guidestone to develop a master operations calendar, write grants for funds and services, write case-studies of successes in our Land Link program, handle most communications and social media, and recruit and manage volunteers. While my time here won’t immediately raise anyone above the federal poverty line, which at $11,490 for an individual or $23,550 for a family of four annually is hardly a bar worth shooting for, I do hope that I can help Guidestone serve its mission and continue to expand the reach of its programs. In turn I hope that leads to more self-reliant, food-rich, and inter-connected communities across the Upper Arkansas River Valley and Colorado. At the end of my term, I will be just one small part of VISTA’s 48 year, 180,000 member legacy of serving throughout America to expand the capacity of homegrown efforts to address poverty in communities. And thats a legacy of which I’ll be proud to be a part.